It is impossible to be spiritually healthy, yet emotionally immature. 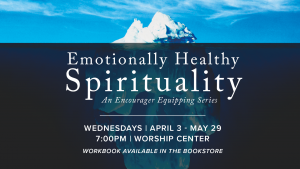 In this groundbreaking, eight- week equipping course written by Pastor Peter Scazzero, you will receive the tools to start your journey to emotionally healthy spirituality. Each week, we’ll unpack core biblical principles to guide you into an experience of lasting, beneath-the-surface transformation in your relationship with Christ. So join Pastor Nathan Cadis each week for a powerful journey that will walk you through a door that will change forever the way you love God, others, and yourself. A workbook/devotional is available in the bookstore for $14.99.